Last summer we introduced a new tradition to the Camp Riverlea experience by introducing “Free Choice” activities a couple times a week. During Juice Break children are given the option to sign up for up to four activities to take part in during free swim. Some activities are traditional camp activities such as kayaking and river walking, and some are new ideas such as an Insect Scavenger Hunt and Yoga on the lawn. Campers get the opportunity to try new things or explore old favorites, but more importantly children get the opportunity to choose. Camper’s days are usually laid out before them. Five activities, lunch, rest hour, and free swim. For some campers these days are followed by swim practice and baseball and scouts troops. In the midst of all that structure its very easy for us as counselors to get sucked into a routine and assume that kids are happy with the status quo. With Free Choice we can also provide children with a much-needed change of pace. Activities such as Story Time in the Grove can create a calm and relaxing atmosphere and create a quite refuge in the midst of a day of running around and exploring the natural world around us.Through Free Choice, we are trying to give the children some agency back into their own schedules and forcing ourselves to constantly evaluate what works and what we can do better. Last session I had the opportunity to lead a game of Sharks and Minnows in kayaks on the pond. Since I am usually a General Counselor with the Hobbits and Baggins I don’t normally get the opportunity to work with the older kids, so leading this activity gave me the opportunity to work with new people and try new activities that I have not gotten the chance to do before. This summer marks my 6th year as a counselor at Riverlea and my 14th year in total. After spending almost a decade and a half at camp it is really refreshing to be able to still experience new things and build on old camp traditions. At its core, Camp Riverlea is a safe place for children to continue to develop and grow in a structured space and environment. Free Choice helps us continue that development and keep camp fresh, both for campers and for staff. Marissa is our 2017 APD/Volunteer Manager! My name is Marissa Minnick and I will be working with all of Camp Riverlea’s Volunteers (Orcs) this summer as Volunteer Manager! I am thrilled to have the opportunity to return to Camp Riverlea this year. After spending summer 2013, 2014, and 2015 as a Canoeing and Kayaking counselor at Riverlea, last year I was taking graduate courses at Appalachian State University, and just graduated with my Master’s degree in Elementary Education! I am excited to return to camp with this new lens on the role of education and leadership in camp, and to be back in a space that is as inviting and inspiring as a summer camp. The Camp Riverlea staff is such a special team, and I cannot wait to welcome first year Orcs as well as returners to another exciting summer at camp! Every member of our staff helps make Riverlea a place for personal growth and new friendships, and each summer brings a fresh opportunity to learn something new. Riverlea’s Volunteers are an essential part of camp’s framework; I am excited to help support them as we work together to create a memorable experience for campers. Please feel free to reach out if you have questions about camp and this upcoming summer! 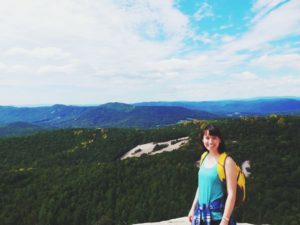 Posted in Uncategorized | Comments Off on Marissa is our 2017 APD/Volunteer Manager! Jessica is our Volunteer Manager! 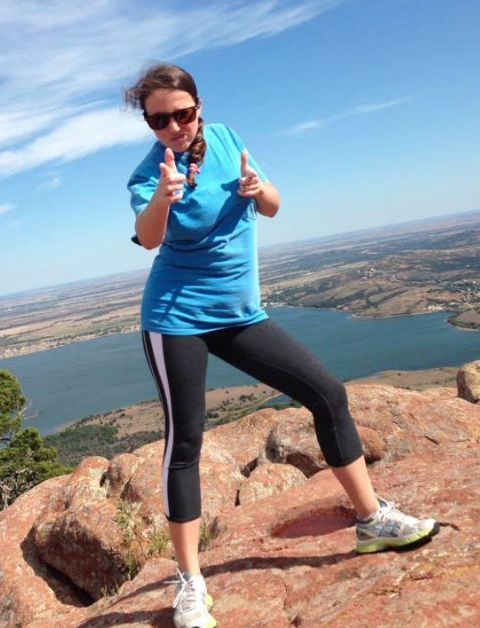 We are excited to announce that Jessica Baroff will be our first ever volunteer manager! We know she will help us greatly improve the value of the Orc experience for our volunteers. For the last six summers, Jessica has been a general counselor with the Hobbits and Baggins and a bus counselor at the Duke stop. While her work with the campers is exemplary and reflective of her deep understanding of child development as well as her commitment to her future career as a first grade teacher, Jessica’s interest in teaching and mentoring young teens is an embodiment not only of her love for Camp Riverlea, but also her recognition of the lasting importance camp has for everyone in the community. 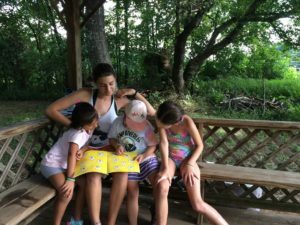 The Orcs who have worked closely with Jessica have become outstanding junior counselors and always end their summer having learned skills applicable beyond the borders of Riverlea’s property. We are grateful and excited that Jessica will be an integral part in the development of this program, and the principal person in its daily implementation throughout the summer. In the months that follow, she will work closely with us to design a teen leadership and CIT program that teaches our volunteers not only the specific things that great leaders do and say to be considered respectful, caring, flexible, inclusive, good at listening, creative, etc., but also how to further develop these skills (and many others) on their own for the rest of their lives. The development and evolution of this program is currently underway. Already we have learned from many excellent programs at day and overnight camps across the U.S. and Canada, and will continue to seek out the ideas that will be most successful at Riverlea. Our excitement for the program continues to spread as we gain a more complete sense of what the implementation and growth of the program will look like, the ways in which initial training and continuous mentorship will improve, and the possible outcomes we — and our volunteers! — can expect. Please join all of us at camp in our hope and excitement for this new program. Posted in Uncategorized | Comments Off on Jessica is our Volunteer Manager! More changes are coming to Riverlea in 2016! Through conversations with campers and counselors, and in various responses from parents via our anonymous online feedback forms, we began a conversation and eventually decided to collapse music and drama into a single department now called ‘performances’. This has been a gradual process, one that we started before last summer when we decided to teach camp songs during all-camp morning and afternoon assemblies. This was part of a broader effort to strengthen our all-camp community, as well as to give new and younger campers more exposure and time to learn the songs that are part of Riverlea tradition and spirit. Moreover, we ask all counselors to help teach songs. This allows them to experience what we ask of the campers: to work together, to showcase their strengths, to venture outside their comfort zones and challenge themselves, and to step aside so others may have the time and space to do the same. Teaching and learning songs during assemblies will continue 2016 and beyond. What we learned from conversations with campers is that music class oftentimes feels like something they do in school (and that this makes it less fun). Without disregarding the importance of camp tradition and the role it plays in feeling connected to a broader community, our goal was to reimagine a program broad enough in its implementation, but specific enough in its goals to allow counselors to easily guide the development of a group performance project that not only showcases each camper’s strengths (helping them feel efficacious and confident in themselves), but also challenges each camper to step outside her or his comfort zone (encouraging them to grow). It is along the lines of challenge and teamwork that we decided to refocus our drama and music departments on collaborative performances. While teaching campers about the requisite skills of stage presence, projection, expression, motion, collaboration, role-taking, timing, creativity, improvisation, etc., we can structure the development of each performance around the strengths and growth of each camper. And, at some point during the last week of each session, each group will have the opportunity to perform their project. I look forward to what our campers can come up with: song parodies, skits, musicals, silent films, choreographed dances, improv sketches, or whatever else they decide (or happen) to create, and to see the creative, collaborative, and challenging journey they have to take in order to get there. We are adding a brand new position at camp! The primary focus for this new person will be the continuous training and mentorship of the orcs, our counselors-in-training. We want this person to be a dedicated resource for orcs, someone they can come to with questions, concerns, or ideas, but also someone they can rely on to understand their individual strengths and weaknesses and provide them with meaningful support and constructive feedback as to how they can continuously improve and be more effective in their role at camp. Such constant feedback and support will undoubtedly accelerate the rate at which orcs acquire and practice new skills, help them to feel and become more efficacious in their work, and bolster aspects of their confidence necessary to more effectively lead campers at camp (and, more generally, groups of people in other settings). Beyond that, we are also in the process of developing a clearly articulated teen leadership program at camp. This is a brand new aspect of the orc program, and will help them to understand specific camp-related behaviors (for example: patiently and carefully building a relationship with a shy camper; being silly in a skit in front of the whole camp; asking critical questions) as generalized principles (being a good leader for everyone; challenging yourself; how to appropriately ask for and receive constructive feedback, etc.). In the same way that we work with staff to understand their responsibilities at camp as generalizable to life beyond Riverlea, we want to help the orcs develop an understanding of and be able to articulate the value of work at camp as it relates to broader workplace, interpersonal, and life skills. This value of this new position can not be understated. For the first time, there will be a specific person whose first priority is supporting and mentoring our volunteers. And, because of this support, the rate at which each orc expands and grows into her or his potential will increase dramatically. All orcs will be better at working and connecting with the campers because of this mentorship and our new teen leadership program. Second, this person allows Annie and I to focus more clearly on supporting staff as they continue to develop new content-rich and meaningful lessons for all of our campers. Our program quality will continue to improve as counselors receive more support and resources to commit to creating and leading engaging activities. Third, the orcs will be part of a more structured leadership program that encourages creativity, increases self-efficacy, and connects them more closely to each other and to the campers. Everyone at camp will feel the immediate benefit of this new position at camp. The hardest part will be waiting until summer to see what happens next. Posted in Uncategorized | Comments Off on New position at camp! This Riverlea tradition can have different meaning to each child: another reminder about the importance of community; more encouragement towards mutual respect, gratefulness, and interdependence; just a colored ribbon with a cheap ring on it; an awesome colored ribbon with a real magic ring on it. When a camper chooses to wear her or his ring the following Friday, I can’t help but smile. Beyond the symbolism of the ring’s circularity, different ribbon colors representing the passing of time, the metaphor of keeping the ring close to one’s heart, and the inevitability of camp experiences shaping a child’s interaction with the world around them, the magic ring ceremony means something to the counselors too. Many staff members were once campers, people with a strong connection not only to the Riverlea community, but also to the physical place. Somewhere in the Hobbit House, their names are covered up by those of more recent campers. They have memories of their old counselors, learning to swim in the pool, who they had a crush on, and what the old Shire looked like before it burned down in 2010. I have these memories. They are essential aspects of my strong connection to Riverlea. I like to think memories like this are being made each summer, that everyone’s connection to Camp Riverlea strengthens with each positive experience. 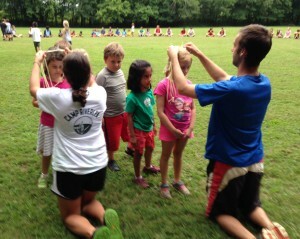 “Is it really magic?” a lot of campers ask me, clutching their rings. Some look skeptical, others captivated. “It is if you want it to be, but you have to really believe in it”. Usually this isn’t a satisfactory answer. I don’t expect any campers to will themselves into flight or invisibility, laser vision or super super strength, nor do I intend to convince them that belief alone can create something. “Yes” or “no” would be boring answers, ones that fail to call into question the nature of magic, the power of belief, and the relationship between the two. I don’t expect anyone, camper or staff, to really work that idea around in their heads while at camp, but I hope it finds its way into everyone’s consciousness sooner rather than later. My belief is that the magic of Camp Riverlea is interpersonal. It happens on the playground, during activities, on the bus, in the Shire. It happens outside of camp, too, when friends get together to reconstruct Riverlea stories from memory fragments. Those, in my experience, are some of the most magical moments. I share them with some of my best friends, people I’ve known since we were campers. In essence, Camp Riverlea is like most places. Things happen there that people can later remember. But what makes Camp Riverlea particularly special is that it’s a community of people willing to believe in, contribute to, and participate in the magic of the fellowship of the ring. I am both excited and proud to say that we spent a lot of time this summer developing a multifaceted and longitudinal plan to continue increasing the quality of Camp Riverlea’s magic for campers and staff alike. Riverlea has many magical years to look forward to. I hope I can come back for more of them. Every three years, Camp Riverlea is examined for reaccreditation by the American Camp Association (ACA), a national organization interested in program safety and best practices for summer camps of all kinds. On Tuesday, July 22, two ACA volunteers, camp directors from other summer camps in the region, spent the day evaluating Riverlea’s written policies and daily practices. Both visitors were very impressed with all aspects of Camp Riverlea. They spent the entire day touring camp and reviewing our written policies and documents (including the staff training manual, transportation safety policies and documents, letter to parents, professional inspections, and counselor certifications among many other documents). Overall, there are seven sections that the ACA reviews at Riverlea: 1) program design and activities; 2) program aquatics; 3) operational management; 4) transportation; 5) health and wellness; 6) site and food service; and 7) human resources. Additional information about the ACA accreditation process and standards can be found here (LINK 1). Additional information about the ACA accreditation process can be found here. Great first week at camp! We just finished a great first week at camp. As counselors fine-tuned their departmental chemistry, they led engaging lessons for kids of all ages. 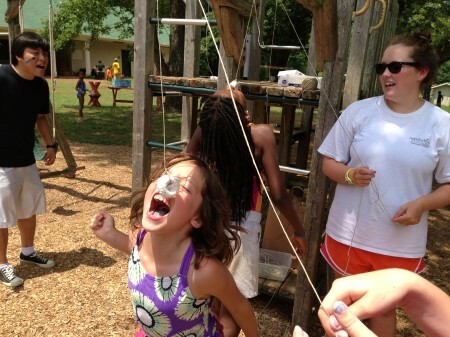 If all you heard was about how much fun (or how hot) camp was, here are some of the things campers have been learning. In agriculture campers were introduced to the plant diversity in Riverlea’s organic garden and learned about the anatomy and nutritional needs of plants. In archery everyone learned the safety procedures of the range, proper shooting technique and form, and started target shooting. 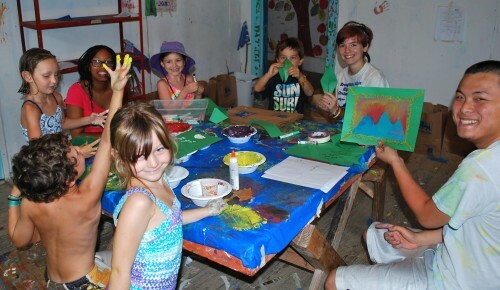 Campers tie-dyed shirts and did other projects in arts and crafts. Our athletics counselors led spirited games of dodgeball and capture the flag. 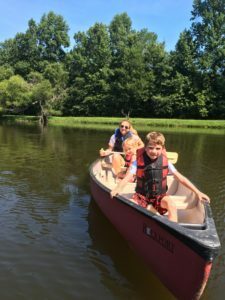 In canoeing and kayaking campers learned the parts of a boat and paddle, then practiced new strokes and maneuvers while playing games in Yonder Pond. Campers learned about their body in space, the importance of voice, and played improv games in drama. For most older campers, golf presented a new set of challenges concerning focus, adjustment, persistence, and patience as they tried their hands at swinging clubs for the first time ever. In music campers were introduced to tempo and rhythm as they played games such as jazz cat and musical mats. Campers in nature classes fine-tuned their attention to visual and auditory detail before exploring the ecosystem in the stretch of the Little River on the edge of Camp grounds. Each day, every camper has a swimming lesson during which they get individualized instruction and encouragement to improve their swim skills. Older campers receive similar instruction in tennis (though not as frequently), and in both cases, new skills are put to the test during group games. 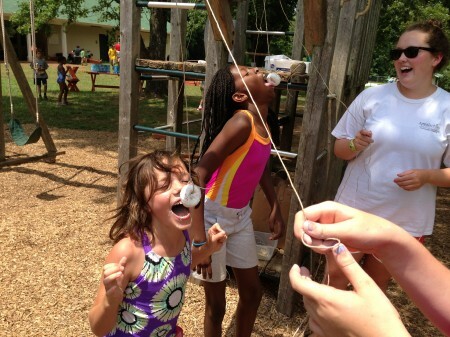 These are some of the many things that go on at camp every week. We also have special events such as the Hobbit Adventure, extra mandatory free swims on the hottest days, trail magic, and lots of time when the kids can talk and play with one another outside the context of a structured activity. Overall, this first week of camp was wonderful, and we have no doubt the next seven will be just as great. Posted in Activities, Camp, News | Comments Off on Great first week at camp! 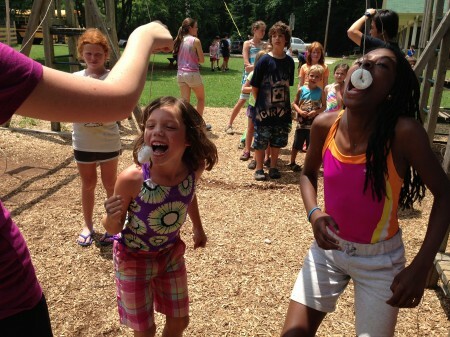 At the camp carnival this year, we had lots of fun stations, such as fortune telling, diving for rings, bean bag toss, and face painting. 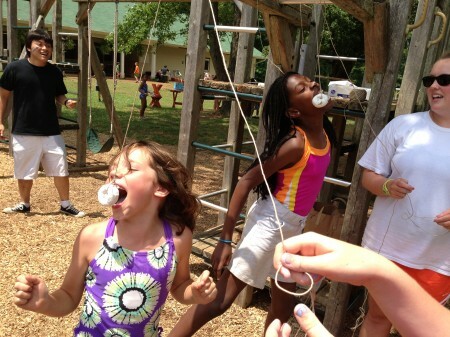 We also had the ever-popular donut on a string game, where campers attempt to eat a powdered donut off of a string while it’s moving. 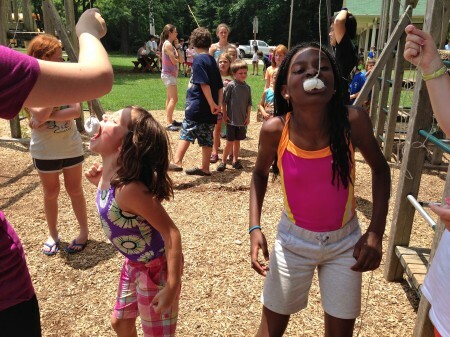 Here is a series of photos of two campers participating in this surprisingly challenging carnival event. Here are a few photo highlights from this summer. To see more, check out our Facebook page and check back here for more! Having fun in with paint and macaroni in arts and crafts! 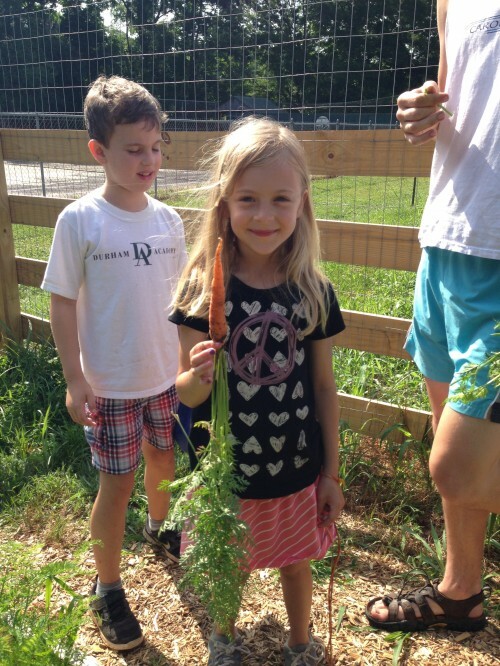 Pulling and eating carrots in the camp garden. 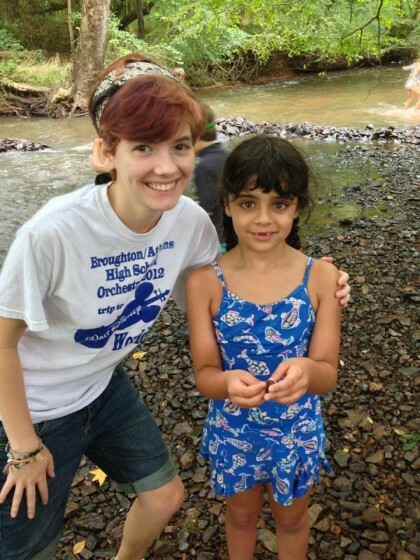 A camper and her counselor at the river. 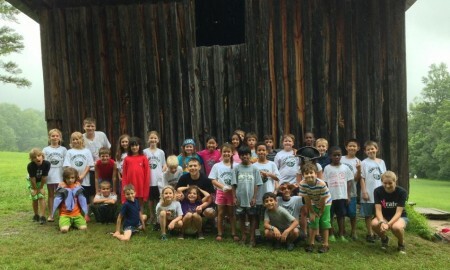 Campers and counselors at Brandybuck. Check out Camp Riverlea on Facebook and Twitter! Follow us on Facebook, Instagram, and Twitter @CampRiverlea for updates and photos throughout the camp day. For questions about groups, buses, and camp activities, please contact Ben. If you have any questions about registration and payment, please contact Fran, (770) 633-7698.